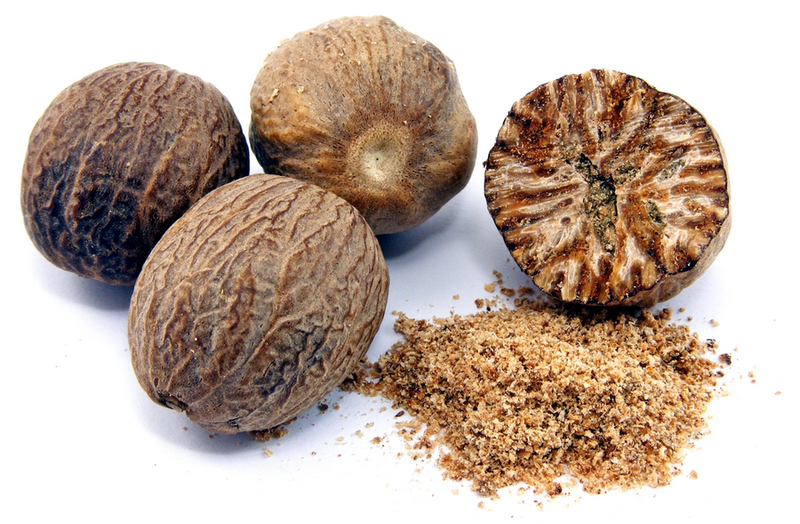 Did You know Nutmeg comes from the fruit of a 50 ft (15 m) tall tropical evergreen tree? Nutmeg is most commonly used as a cooking spice. The tree grows in Indonesia, New Guinea, and the West Indies. The dried nut and essential oil are both used to enhance your health. Nutmeg is used in both Western and Chinese herbal medicine. It is most popular as a spice in food and drinks, and is also used in cosmetics and soaps. In ancient Greece, and Rome, nutmeg was highly valued and expensive. People were convinced it stimulated the brain. The Arabs have used nutmeg for centuries. Nutmeg relaxes the muscles, and helps remove gas from the digestive track. It is most commonly used for stomach problems such as discomfort with indigestion. It is also used for chronic nervous disorders, kidney disorders, and to help with nausea, and vomiting. In Chinese medicine, nutmeg is used to treat abdominal pain, diarrhea, inflammation, impotence, liver disease, and vomiting. Some cultures have been know to use nutmeg as an aphrodisiac.